Another morning of waking up to my hand bit up by one of our cats. It’s not really her fault. She’s very old and almost entirely blind, but she loves to sleep up by my head. When I move in the night and extend my hand out under my head, sometimes it bumps and startles her, so she reacts. I don’t know how much longer she has left, though, so I don’t have the heart to make her sleep anywhere else. Someday I might miss these mornings of bandaids and Neosporin. 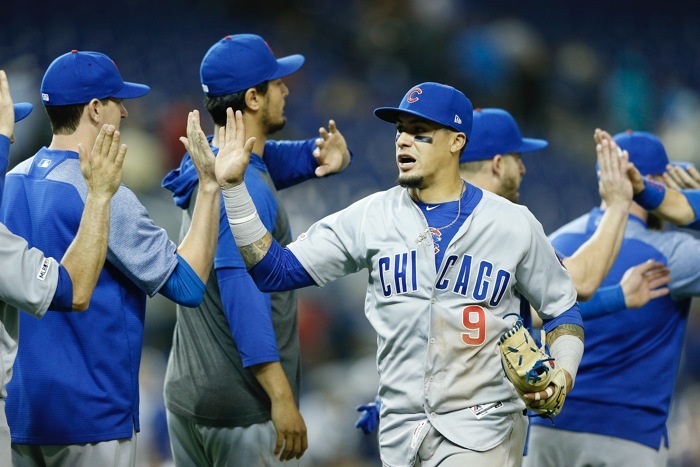 You can’t undo the losing that kicked off this season, but the Cubs are at least now winning games they should be winning, 6-3 over the past nine games. Moreover, only the Dodgers and Phillies have a better run differential than the Cubs this year. 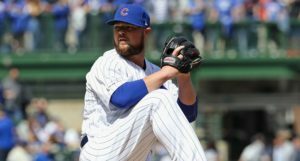 It’s easy to forget: without a few flukey blown leads, the Cubs could easily be 10-6 right now, without their core performance having really changed. 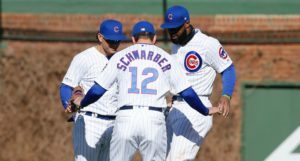 Don’t get me wrong, you can play that game with wins, too, and you can do it all season long – I’m more just making the point that the Cubs probably have been “better” than their 7-9 record, and things are trending in a positive direction. He very well could have been getting today off anyway after a couple straight starts, but we’ll keep an eye on things juuuuust in case. 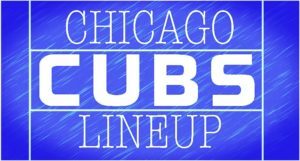 Bote currently hitting .294/.385/.500 (131 wRC+) on the young season. Christian Yelich is straight OWNING the Cardinals this year. That’s Yelich’s 9th homer of the year, and since the All Star break last year – NOT A SMALL SAMPLE! – the guy has seen 45.3% of his fly balls leave the ballpark. I truly cannot wrap my head around that. A 20% rate had generally been seen to be (1) very, very good, and (2) about the max of what you could actually control. Certainly the current era has changed some of those dynamics, but not to this extent. This is f***ing insane. He’s untapped something peculiarly unique to himself right now. I’m not sure it will last all year, but it’s not just a fluke at this point. It can’t be. The good news for them is that, after next Wednesday, the #STLCards have four months to figure out what to do with Christian Yelich. They don’t see Milwaukee again until mid-August. A reminder that the work is what matters and we’re talking about only 48 plate appearances so far, but currently, Happ’s AAA strikeout rate is a completely unacceptable 33.3%. A crazy mix of Deals of the Day at Amazon today, including Segways, electric mosquito repellant devices, and food slicers! 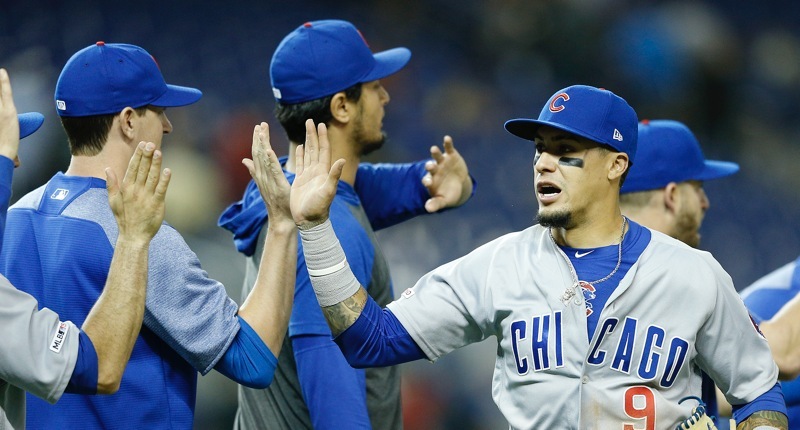 The Cubs have won 6 of their last 9 games. Four Stars of Cub Farm. Rough day for system. 0-3. Outscored 26-6. 4. Chris Morel. 2 singles! 3. Nico Hoerner and Tyler Durna. XBH in 1/4 efforts. 2. TNS bullpen. Clarkin, Short, Effross. 1. Jonathan Sierra. Team’s first HR. 6 TB. Has a hit in every game this yr.
That included Thomas Hatch, who’d been eye-poppingly good in his first two starts, getting absolutely torched at Tennessee. Bummer. Hopefully it was just one of those things where it was like, “OK, we see what you’re doing, and it’s great. Now let’s see if we can incorporate more of Pitch X in Situation Y,” and it was a … learning experience. 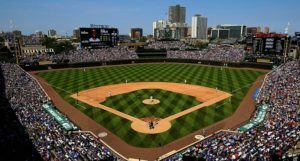 Next Post Next post:Bryzzo is Struggling Equally, But in Different Ways – What’s the Story with Anthony Rizzo?